Health benefits of touching the bare ground. Do you notice you feel better when you walk barefoot on the Earth? Recent research has explained why this happens. Your immune system functions optimally when your body has an adequate supply of electrons, which are easily and naturally obtained by barefoot contact with the Earth. Research indicates that electrons from the Earth have antioxidant effects that can protect your body from inflammation and its many well-documented health consequences. For most of our evolutionary history, humans have had continuous contact with the Earth. It is only recently that substances such as asphalt, wood, rugs, and plastics have separated us from this contact. It is known that the Earth maintains a negative electrical potential on its surface. When you are in direct contact with the ground (walking, sitting, or laying down on the earth's surface) the earth's electrons are conducted to your body, bringing it to the same electrical potential as the earth. Living in direct contact with the earth grounds your body, inducing favorable physiological and electrophysiological changes that promote optimum health. There is an emerging science documenting how conductive contact with the Earth, which has is also known as Earthing or grounding, is highly beneficial to your health and completely safe. Earthing appears to minimize the consequences of exposure to potentially disruptive fields like "electromagnetic pollution" or "dirty electricity." Some of the recent evidence supporting this approach involves multiple studies documenting Earthing's improvement in blood viscosity, heart rate variability, inflammation, cortisol dynamics, sleep, autonomic nervous system (ANS) balance, and reduced effects of stress." One of my most favorite activities during the warmer months is going out to my garden, sitting on the ground and pulling weeds. I always feel the most healthy during these months and now I know why. Re: Health benefits of touching the bare ground. Growing up barefoot during most of the Spring and all of the Summer I can understand this. Just recently while walking the mountain with the dogs I got the urge to slip off my boots and walk barefoot up the mountain. Even in the cooler temperatures it felt wonderful. I envy you being able to do this now. It's far too cold here where I live. It is far to cold here too. I did it during a brief "warm" period one day. Aside from it being too cold, our land and walking area has been invaded by alien sticker weeds from H E L L.
I spent 30 years clearing my land of thistles, poison oak, blackberries, and some manzanita, now I have a clean and healthy forest. That was when I was younger and healthier, but at least it's manageable now. My brother a mile away has been invaded by Scotch broom, while his neighbor is overrun with thistle. The terrain changes dramatically here, so every other mile has its own unique issues. 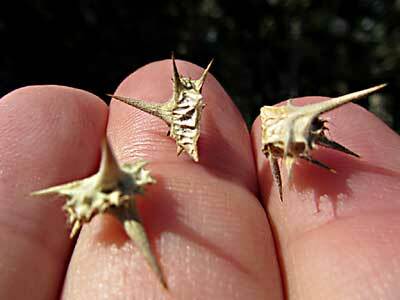 We had something similar in the valley called bullhead thorns, the things could flatten a bulletproof tire. What you call Bullhead, we call Goat Head. We are always on the look out for those plants. The thorns we have grow on the ends of grasses. If I knew how to post a photo here, I would show you. I did a search for both, bull and goat, but the same pics came up, I think it's a dialect issue from state to state to state. But they look a bit different in differing topographies, but still the same weed I think. Either way, they're tough to get rid of, grazing sheep and goats will eventually irradicate them. If it weren't for the cougars here, we'd probably get a couple of goats, just to keep the weed grasses mowed down. Yep, same here. Too many of my neighbors have lost livestock to Mt lions. One had a couple of cubs, she used 12 goats as training for the young. 'Didn't eat or take one away, just slaughtered every one of them. It was horrible. Though it was her own fault, she had them in a horse arena 300 yds from the house, no dogs, just all alone, like bait. I may get a couple of cows, but they'll be by the house with the chickens and dogs. What you call Bullhead, we call Goat Head. I and the good wife have been through all of the state West of Texas. I have found them in each state. Traveling out of Western Washington state, we had to get special tires for our cross country bikes. Or you are fixing tires off and on through out the day. My very first experience with them was on a racer with skinny tires. I had over 100 in each tire, I threw them away and had to buy new. Man, those are the worst thistle in the world, even had them stuck in my shoes before.